Fire Engines Photos - Dennis Sabre Cleveland.August 2000. N750YAJ is seen at Hartlepool (Stranton) open day on 13th Aug 2000.It was running as India 1. According to my latest fleetlist (April 09) it was still at Strantin as their reserve pump.Any info on it's current allocation would be welcome. Hi Chris. N750 (India-3) was displaced at Stranton around August 2006 by the arrival of NY03LJV (as India-2) with R248 in turn becoming the new India-3. N750 then moved onto Headland retained displacing J688 to become the new Hartlepool YFA pump. N750 was then displaced from Headland (around January 2009) by the arrival of S667 from Redcar. N750 is currently a reserve pump. Added by Mark P. on 04 March 2010. Hi Mark, today I saw this on Acklam Road as a Trainer! (7th April 10) It carried the Driver under Instruction plates and was doing Blue Light training. I presume it has now joined the Training School. Added by Chris Hall Teesside. UK. on 07 April 2010. I'm not sure what the latest is with the other Driving School Pump (L680) as I haven't seen this one about for ages now. I suspect this one may be disposed now too. Added by Mark P. on 08 April 2010. H551 is at the workshops, dumped in the corner! It still has "Stockton" on the station allocation plate, also M813 TVN is still a reserve, It was reserve at Skelton on the 22/06/10 - atleast one SS is still on the run .. just! Added by Adam Plumb on 28 June 2010. Added by Ian Mcpherson on 29 June 2010. H551 and L679 were dispatched off to the auctions at Washington last Friday (25/6). DDC1 has apparently been sold to a brigade in Southern Ireland but was still parked in Stockton station this afternoon (29/6). Cleveland are to retain the DDC1 index though. Reserve M813 is still on the run and is today deputising for L3 at Guisborough. 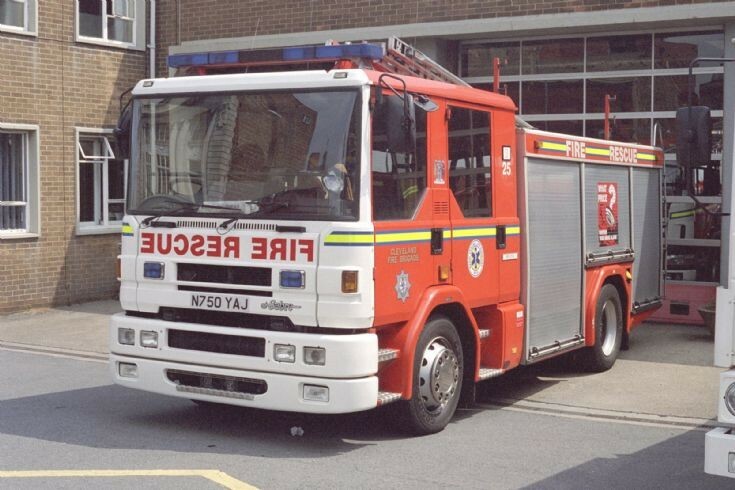 P314 (ex Loftus) was seen today wearing a "R1" call-sign and N746 (ex Saltburn) was seen today wearing a "R2" call-sign. Both noted in the yard at Training School. As for the other hand-downs, once NX06 AOE joins Thornaby, NX03 MGV will be off up to Billingham to allow R246 to move to Guisborough. NY03 JUF is currently at workshops awaiting preparation before it's move to Marine from where R247 will move to Skelton. N750 noted in the yard at workshops today still wearing the driver training plates. Added by Mark P. on 29 June 2010. Added by Andy Middleton on 30 June 2010. Added by Ianmc on 30 June 2010. Thank you Ian. Need the Sabres to complete the set. Added by Adam Plumb on 01 July 2010. Added by Chris Hall Teesside UK on 01 July 2010. Update, Skelton got their new appliance this evening, however it is not R247 JNL it is in fact Middlesbroughs former Alpha 1 (NY03 JUF). Hope this helps. Added by Adam Plumb on 26 July 2010.
hi all i purchased H551 NAJ for preservation on wednesday,looks a bit sorry for itself but nothing some tlc wont fix,i was told it was based at marine as well? Added by Martin Norris on 30 July 2010. I have a photo to upload of H551 from beginning of june 2010 when it was still at workshops .. Shame to see these SS machines being sold, what are your plans for it, keeping it as it is in Cleveland colours? (as it should be! lol) .. I couldn't help but notice your email address.. are you stripping it into a party engine? Added by Adam Plumb on 31 July 2010. Hi adam I'm not I'm keeping it for preservation,I've seen a pic of it back in 1992 and I'm hoping to get it to look somewhere near to that spec.1 of the doors is very bad and there's quite a bit to do but I'm lucky to be blessed with painting facilities.hoping to have it painted and finished by the end of the year.would love to find out more about it,just been told it was a learner vehicle as well at some point. Added by Martin Norris on 31 July 2010. Fantastic to hear one of the Cleveland SS's is being preserved. Added by Pete G on 31 July 2010. How wonderfull it is to hear that H551NAJ has been acquired for preservation! I've just trawled through my records for some information for you. New in 1991 my First recoring of it is at Grangetown on 8-10-93, so it was probably new to that station. Thornaby between 31-1-95 till 31-2-96. Training school 2001 - 2004, then disposed of. Bear in mind these are my own observations so some of the dates may need tweaking here and there.Would be great also to see some pictures of its restoration on this site. once again well done! By the way Martin, have a look at my picture of H551NAJ in picture #22200 to see it in 1995 having a wash.
Added by Chris Hall Teesside UK on 31 July 2010. Many thanks for that its much appreciated and your welcome to pop over sometime to have a closer look,i did message you last week on your north east transport site asking you to contact me about H551 and another ex cleveland appliance currently in dire straits that im hoping to rescue in the next couple of weeks,if you recieved the message all the infos on there,if not could you mail me direct when you get time and ill reply as soon as i can.thanks again!!! Added by Martin Norris on 01 August 2010.